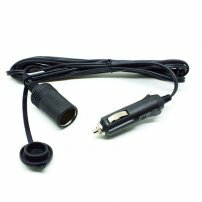 Heavy Duty 12V 15A 6FT Car Cigarette Lighter Socket Extension Cable / Extender with Fuse : allputer.com - Accessories for all your Portable Electronics & Computers! - Convenient: A Cigarette / Lighter Male to Female Extender Cable for connecting other devices remotely. - Universal: Extends your 12-volt power source to cooler, blanket, spotlight, inverter, refrigerator, coffee maker, car appliance. - Electricity: 15A, 12V Max.